Come join us for our annual Field Day, a FREE admission event! Start the day with our annual road race, then come to the ball field at 10am for lots of family activities! Climbing wall, bounce houses, dunk tank, face painting, our famous lobster raffles, food and refreshments! Other activities being planned include an art sale and touch a truck event! Follow our event page on Facebook for updates! 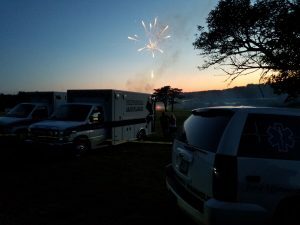 40th Annual Phippsburg Fireman’s 5K Road Race & 1 mile Fun Run! Please come and support the Phippsburg Fire department by entering their annual road race! There will be a 5k walk/run race and a 1mile fun run. Registration begins at 7:00am and the races will begin at 8:00am. The kids fun run will take place first, followed immediately by the 5K. Adults Cost $15 if registered by July 17th, $20 on race day (includes T-shirt) Youth Fun Run $10 (includes T-shirt) Lobster prizes as well as first fireman to cross the line, first male, and first female. 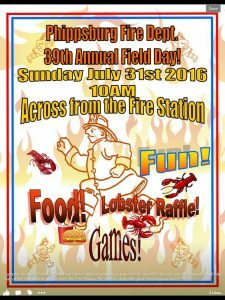 The race will be followed by the Phippsburg Family Fun Day @ 10am in a multitude of fun and exciting activities. Come join us for our annual summer craft fair! Sales of local crafts, baked goods, great raffles! Hot dogs and crabmeat rolls served for lunch and enjoy homemade blueberry cake. Come out and show your support, and bring home some goodies! Meet at the Phippsburg Fire Station for all needed supplies; ALL children must be accompanied by an adult. We have sections of road great for groups with kids..just ask! Make sure to come back for LUNCH and let us say thank you! Already cleaned a part of town? Let us know! Rain date April 28th, in case of heavy rain only! Our Annual Fireman’s Field Day is free fun for the whole family! Start the day with our 5K or 1 mile fun run. At 10am the ball field opens up with music, bounce houses, games and food. Watch local firefighters have some friendly competition in the muster starting at 10am! Fire trucks, handtubs, and replica of Squad 51 from Emergency! will also be on display. Please join us at Anna’s Waters Edge Restaurant on Monday August 22nd from 4-8, for our 15th annual Fire Night fundraiser. The Fire and Rescue departments take over the dining room! Please plan on joining us July 31st for our kids’s fun run and 5K event followed by Field day across from the Fire House. 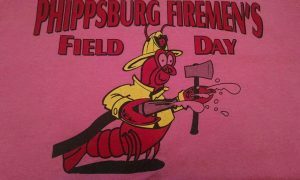 A new domain name, phippsburgfire.org, has been created for the Phippsburg Fire Department. Both a web site and mail servers are in a state of active develpment. The site www.phippsburgfire.org will it least start out as a WordPress site which should make adding content easy to do. Stay tuned as the site in being updated quickly. Thanks!